We had a wonderful Easter weekend - our first holiday in the new house! 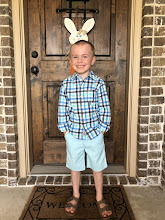 Next year will be even more fun because we will be able to put out our Easter decorations and do more activities (that are still packed away) leading up to the big day. However, we still made the most of it and had a great weekend. Friday night after eating pizza, we dyed a few eggs. We kept it simple because while Parker is getting bigger and older, coloring eggs will definitely get easier and more fun for him as he grows. We just did a dozen and used three colors. I, along with Bob and Larry from "Veggie Tales", have been teaching Parker the song "Down in my Heart" so he's doing this cute face lately where I'll say "show me happy" and he gives me a big cheesy grin. 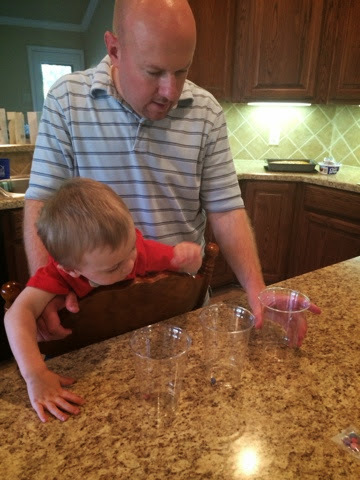 Parker's favorite part was dropping the eggs into the colored water. Being 2, he didn't have much patience to wait around and see what they looked like after that. He's always on the move! I have to credit the Bubble Guppies for the title of this post. Their episode all about the library was called the same. Clever. One of the things I was looking forward to about being back home was getting back to going to the library with Parker. Rockwall County has a wonderful library that we have really enjoyed. Last Friday, I took Parker to the library to look at/read a few books and of course, check out a few. We also checked out a Veggie Tales DVD. He also loves to explore all around the children's section - which is quite large. We had such a fun time and can't wait to go back. We hope to go to story time next week and then maybe get into a routine of going every other week. As I like to to do, I wanted to look back at a few pictures from one of the last times we went to the library before I share some from our visit last Wednesday. I always like to see how Parker has grown and changed. These were taken in May 2013 - almost a year ago!